I'm sorry but at this point the Grateful Dead are worked so deeply into the fabric of my life that the name has lost all meaning. I can't even look to my kids to get a fresh perspective on what they think the band's name is all about. For them, the Grateful Dead has been around forever, so there was never a moment where they saw it as new and questioned me about the potentially creepy nature of the name, or what it's all about. To one degree or another, the band's persona is also woven too deeply into the soundtrack of their lives to wonder about this. Just the same, the phrase Grateful Dead is pretty intriguing, whether for a rock band or otherwise. And while I am far from the first to do so, I thought it interesting enough to spend a little time discussing the collective wisdom that surrounds the nature of the band coming to be called the Grateful Dead (changing their name from The Warlocks in late 1965) and the potential meaning behind the name. If you haven't happened across all of this stuff yourself, it's a nice little read concerning the origin of the band's name. Phil Lesh's biography: "...Jer[ry Garcia] picked up an old Britannica World Language Dictionary...[and]...In that silvery elf-voice he said to me, 'Hey, man, how about the Grateful Dead?'" Alan Trist, director of the Grateful Dead's music publisher company Ice Nine, notes that Garcia found the name in the Funk & Wadnalls Folklore Dictionary, when his finger landed on that phrase while playing a game of "dictionary". In the Garcia biography, "Captain Trips," author Sandy Troy states that the band was smoking the psychedelic DMT at the time. In the summer of '69, Phil Lesh told another version of the story to Carol Maw, a young Texan visiting with the band in Marin County… In this version, Phil said, "Jerry found the name spontaneously when he picked up a dictionary and the pages fell open. The words 'grateful' and 'dead' appeared straight opposite each other across the crack between the pages in unrelated text." And in Blair Jackson's book "Playin' In The Band" we find all of these paths fusing in Garcia's own telling: "One day we were over at Phil's house...He had a big dictionary. I opened it and there was 'Grateful Dead', those words juxtaposed. It was one of those moments, you know, like everything else went blank, diffuse, just sort of oozed away, and there was GRATEFUL DEAD in big, black letters edged all around in gold, man, blasting out at me, such a stunning combination. So I said, 'How about Grateful Dead?' And that was it." This last version is the one that rings most true with how the story made its way to my ears long before there was a wikipedia or multiple books that speak to the subject. There is also the thinking that they picked the name after finding it in the Egyptian Book of the Dead. But this somehow implies far more thought process being involved. The band is historically documented as being devoid of any desire to inflict their own "trip" on anyone, and the thought that they were thinking the naming through on this level strikes me as a bit preposterous. Perhaps personally they mused over such things, but as for trying to design a particular aura around the name—I doubt it highly. Very thought provoking. This is a wonderful connection to the term "grateful dead" and lyrically it could just as easily come out of some lost song that didn't make it on to the Aoxomoxoa album. 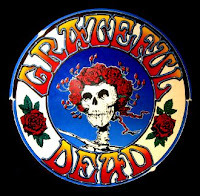 GRATEFUL DEAD: The motif of a cycle of folk tales which begin with the hero coming upon a group of people ill-treating or refusing to bury the corpse of a man who had died without paying his debts. He gives his last penny, either to pay the man's debts or to give him a decent burial. Within a few hours he meets with a traveling companion who aids him in some impossible task, gets him a fortune or saves his life. The story ends with the companion disclosing himself as the man whose corpse the hero had befriended. Good stuff to ponder over when you somehow find time to spare while not listening to the over abundance of Grateful Dead music out there. As if there wasn't enough music to fill our heads 24 hours a day, when we do manage to take a breather from those 1973 Dark Stars, we have no shortage of things to think about. Have you ever heard any other stories related to the naming of the Grateful Dead? One of the problem with "seminal" stories is that stories take on a life of their own to the teller, and an imagined memory is just as convincing as if it really happened. You can see this when people in your family tell stories about you when you are younger that aren't really true, but correcting the teller (usually your mother) would be rude, so you let the tale stand. I think Jerry and Phil just remember telling the story so many times that they don't recall what happened. No one ever asks them why they chose the name Warlocks. There's an interview with Jerry from 1975, by Mary Travers, accessible at http://www.wolfgangsvault.com/jerry-garcia/concerts/interview-august-06-1975.html. At about 11:15, Garcia explains to Travers that at the beginning of their career, the Dead played "divorcee bars" on the Peninsula. Travers says "really?," and Garcia says "oh, yeah for years!" with great conviction. Actually they played divorcee bars on the Peninsula for about 7 weeks, perhaps 10 weeks at the most. Now, it must have seemed like years to Jerry, but it simply wasn't true. At the time of the interview, it was just 10 years prior, but already the inserted memory has become real to him, because that's how human nature works. We will never find out the true story of the Dead's naming, which is part of the charm. The people there don't remember, and anyone else who might recall--a girlfriend who was told later that night, for example--has also had their memories mediated by the endless retellings. Now, if someone asked Weir or Billy why the band called themselves Warlocks, they might get a direct and somewhat accurate answer, but it wouldn't be fascinating. The bit about the Egyptian Book of the Dead (aka "Awakening Osiris") is likely fictional, as nobody has ever really documented that quote in the text of the book, ie. translator, page number, published by, etc. However the "Anthem of the Sun" is said to be a musical piece played by an Egyptian orchestra back in Pharonic times. Somewhere back in the 80s Garcia told me his version of the name change. He stated that Bill Graham was going to have some flyers printed up to promote a local concert and he stipulated that if they didn't change their name from The Warlocks to something else he wasn't going to include them on the flyer. Jerry did find The Grateful Dead in Phil's Dictionary and thought well OK how about Grateful Dead then as a way to meet BG's demand that they change their name. The drift was that they thought it would rattle Graham even more than Warlocks did so they agreed to become The Grateful Dead. no insights on the origin of the name change - but i thought it was interesting how you mentioned the perspective of your kids and "potentially creepy nature of the name"...my kids always known the dead as "the skeleton band" having seen the skeleton mascot on various books, websites, cd covers, tape covers, etc. even at a young age (2-3) this didn't phase them as they see skeletons as cool halloween dudes, not creepy dead bones. so -- when they started hearing the real name "grateful dead" it just made sense! O what the hell - three pillars of Zen, three pillars for the name of the Dead - might as well throw out what I think is the third: the visual impact of the name. There is simply something sunny about the appearance of the word "grateful." I think it is the letter "a" making a long "a" sound, which is why "grey" looks darker than "gray." (Bet a hundred dollars there's some kind of story about "Touch of" being spelled "grey.") And the one word I would use to describe Garcia's guitar solos is sunny. I was listening to the Grateful Dead channel today (1/3/10) on my Sirius radio, and they were playing an interview from 1969. The question of the band's name was asked. Jerry responed that the name came from a dictionary. Bob confirmed. They did not elaborate. They did say that some people in the band and Bill Graham thought the name was too "weird", and Grahm did not want to bill them with that name.